TOM SPURGEON: Tell me what you've been up to comics-wise, Bill. Where can we find you right now? How engaged do you remain by the form? BILL KARTALOPOULOS: I've been up to a lot. My major work activity is teaching at Parsons, where I teach a class called "Reading Graphic Novels" as well as "History of Illustration" and, beginning next semester, a new "Comics History" class. I review comics for Publishers Weekly and I periodically write about comics for Print Magazine, where I'm a contributing editor. The Print pieces tend to be 101-style articles on major subjects, based on book projects like the big Töpffer book, the Panter monograph, or this year's Kurtzman books. Beyond that, though, I've recently been putting a lot of energy into a variety of public events about comics, functioning as a public speaker, moderator and organizer. I've been the programming coordinator for SPX since 2006, which is always a big project. I also planned the programming for -- and moderated panels at -- the Brooklyn Comics and Graphics Festival, which was amazing. 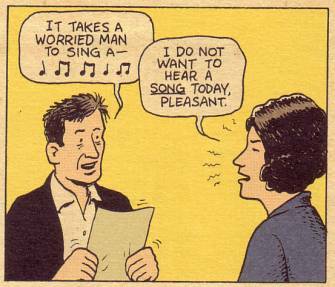 This year I also organized the Comic Strip Serenade musical event with Mark Newgarden, presented a paper at ICAF, spoke and moderated panels at Fordham, Parsons, TCAF and the New York Center for Independent Publishing, and organized and moderated a three-panel speaker series for the CBLDF. I'm probably forgetting something. Thinking about the work I've been doing lately, it seems like I'm constantly engaged with the form, but maybe in a different way than most of the critics you're talking to for this series. For the most part, with my teaching, the public events and the type of writing I often do, it seems that, to one extent or another, I'm engaging this work at a high level and then trying to effectively communicate about it to an audience that isn't necessarily as immersed in the subject. This has been really interesting for me, but is a little different than participating in a full-on critical discourse with fellow experts. I should also add that in the past I've done some work for Art Spiegelman and Françoise Mouly, and I still get tagged in occasionally to lend a hand here and there, which is a privilege and a continuing education all by itself. Plus I live in a crazy apartment with several cartoonists. Running into Austin English in the kitchen at 1:00 am and talking about comics keeps me pretty engaged. I actually maybe need to engage a little less. SPURGEON: Can you describe how you encountered Kramers Ergot 4? What were your initial impressions? I remember people being surprised and excited about it, and my memory is that earlier issues of KE didn't really promise something like that issue. KARTALOPOULOS: My context may have been a bit different than yours in that I hadn't read any previous issues of the anthology. 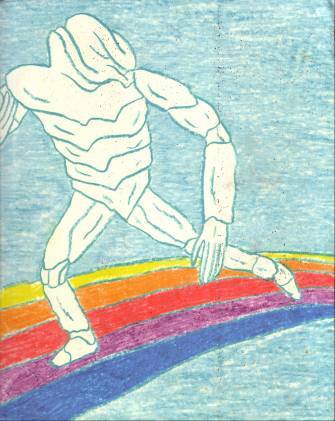 I don't think I'd even heard of Kramers Ergot until one of the KE4 contributors began dropping some teasers on the Comics Journal's message board. I didn't immediately recognize the names of all of the contributors, so I was a little suspicious, to be honest (especially since the title of the book made no sense). I'm sure I was initially put off by the notion that I was maybe out of the loop on some of this stuff. It's interesting that earlier in this series Sean T. Collins talked about Blankets as the obvious "book of the show" at that year's MoCCA festival and mentions Kramers as an important but secondary event. To me, it felt like they were two equivalent, parallel events. Top Shelf's bar at the front of the room took up more space than Sammy Harkham's table in the back corner, and they probably sold more books, too. But it was the difference between a long line of people waiting to pick up a much-anticipated, highly-touted book from an established publisher, and a small mob trying to get their hands on a lesser-known, mysterious item that seemed to promise light and heat. It's a difference of sensibility, and if one "event" was technically bigger, I think the quality of the enthusiasm over Kramers more than matched the quantity of enthusiasm over Blankets. Having said all that, I should also note that I had already read Blankets, which I'd received as a review copy some months prior to the book's publication date. I had been looking forward to Blankets but was disappointed by the book and eventually wrote a negative review. Maybe if I hadn't gotten that review copy I would have spent my money on Blankets instead. But the way things worked out, it may be that I was absolutely ready for something else to grab me that summer. SPURGEON: Am I right in remembering KE4 as a continuation in a sense of some of the things Jordan Crane had been doing with NON? How do you find a context for KE4, where do you place it in terms of what was swirling around the art form at the time? KARTALOPOULOS: It's true in retrospect that Non #5 was a direct, immediate precedent both in terms of the avant-garde comics anthology-as-art-object and in terms of overlapping aesthetics, but I hadn't seen Non #5 at the time so I wasn't thinking about it at all if I was trying to contextualize KE4 in 2003. My perspective is that of someone who hadn't been following most of the artists in KE4 very closely up to that point. 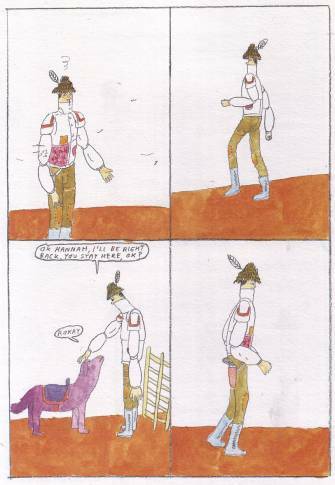 From my position, KE4's biggest impact in comics may have been in successfully asserting the value of comics and artwork that either came from or had stylistic sympathy with the work produced by artists associated with Fort Thunder and Paper Rodeo. I suspect this is an association that probably gets laid at Sammy's feet too much, as if Kramers is a high-gloss extension of Paper Rodeo or Monster, and it's definitely not that. But I don't think you can undersell that component of KE4's impact in 2003. At the time the Fort Thunder/Paper Rodeo artists and their peers really seemed like the most aggressively different group of artists in comics, representing a real break from the kind of traditional craft values and methods of production that still held sway in alternative comics. It seemed like everyone knew about this stuff, but it wasn't widely embraced. Tom Devlin's Highwater Books seemed to be the primary exponent for this kind of work up to that point (although that's not all that Tom was doing). 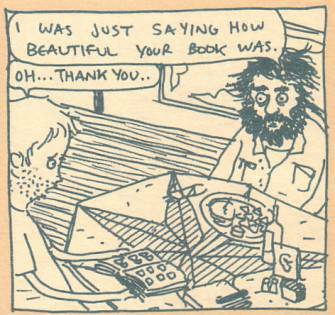 Many of the artists I'm thinking about had probably been most widely seen in the two issues of the SPX anthology that Tom co-edited in 2000 and 2001. That was a hugely important thing that Tom did, and KE4 seemed to take everything a crucial step further by presenting this work in a more optimal format and within a more congenial context. To be fair, Tom was up to more or less the same thing himself, but he was sporadically publishing well-conceived individual books in a relatively low-key way. Teratoid Heights came out around the same time as KE4, and I think KE4 did benefit from previous efforts to get some of this work out there. A major difference is that KE4, as an anthology, positioned these particular artists as pillars of an expanding landscape that also included many other very different younger artists like John Hankiewicz or Dave Kiersh who may have been -- up until then -- generally regarded as somehow marginal or aspiring, but who actually already deserved attention on their own terms. KE4 was a bit less connected than Non was to the pool of artists who had already made inroads among the SPX crowd, but at the same time very few of the artists in Kramers were totally unknown to someone (not me) who was paying close attention to mini-comics. So, depending on one's prior reading, KE4 may have ultimately been more shocking in its valuations and presentation than its "discoveries," and the book's overall statement may have actually been more generational than aesthetic. But the total effect was such a revelation for so many readers at the time that Kramers definitively broadened the range of "acceptable" aesthetics within comics while endorsing a rising generation of artists. SPURGEON: I wanted to ask you about a couple of obvious surface elements that I nonetheless thought important to how KE4 was received. One was its size -- there's an argument to be made that it gained attention by sheer volume -- and the other is the beautiful cover by Mat Brinkman. What does it say about either one that they had a significant impact on how the book was received, the degree to which some folks paid serious attention. It seems like several times during the decade there have been significant, serious works of art that have led their PR with a page count or a size in terms of overall dimensions. Why does comics process works in that way? KARTALOPOULOS: Why does comics process works in that way? I think for a lot of different reasons, including the collector mentality, a history of Western narratives about artists and masterpieces, a marketplace that rewards novelty, and good old fashioned Freudian psychology, to name a few. Obviously we're also living in a time that's been both privileged and deformed by the rise of the graphic novel format. It's great that you can find this stuff in bookstores, but the book trade and associated publicity and media networks (not to mention many readers) have swallowed this teleological fallacy that long = serious, so I guess in some cases it's presumed that longer = seriouser. As for Kramers, sure, the size made a statement. A huge anthology of work by relatively lesser-known artists is asking for serious engagement. It's kind of hard to separate size from production values, though. If the book had been that many pages but black and white, in standard comic book dimensions, and on newsprint, it wouldn't have been the same thing exactly. This book has heavy, uncoated paper stock, generous dimensions, and full color throughout. 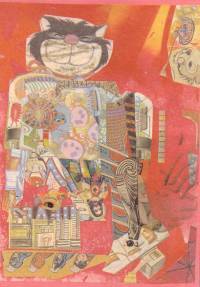 The lush format makes an implicit statement about the quality of the artists' work. Many of those artists hadn't been able to publish in color before, and they all showed that they were up to it. Today, the book still looks great and has a nice tactile quality. As an object, this may still be the best looking volume in the series. And the cover is, to me, iconic of the final and total emergence of a certain aesthetic "school" within comics (even if it had already gained traction in other fields). SPURGEON: I have questions about some of the comics included, but I also wanted to give you the chance to talk about whatever offerings you think particularly striking or significant or important. What works stand out for you know some six years later? Why? KARTALOPOULOS: In general, what stands out to me now is how little of the Fort Thunder/Paper Rodeo/low-fi-gestural-maximalist kind of work is actually present in this volume. I don't think this undercuts what I was saying earlier about this book's position as a breakthrough presentation of that kind of material, but there's quite a range of work in here. In 2003 my #1 clip-and-save piece was C.F. 's story. That, to me, seemed like the piece most emblematic of what this anthology uniquely brought to the fore. At the time it seemed like something from another planet. Now that I've become more habituated to Christopher's work it simply strikes me as a very strong, self-contained, more superficially gag-oriented short piece from an artist whose work I usually look forward to. 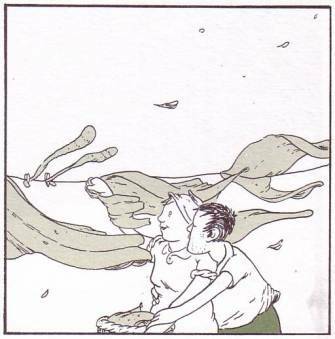 It's nice to re-encounter pieces by artists whose work I've become more familiar with in the intervening years, like John Hankiewicz and Anders Nilsen. It's nice to see artists whose work we haven't seen much of lately, including Tobias Schalken and Geneviève Castrée. It's also nice to see artists like Renée French and Dave Kiersh in the mix, who are still making art but seem to be working at a slight remove these days. 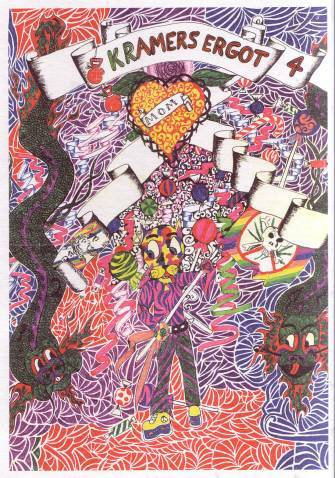 Sammy's "Poor Sailor" is very straightforward but still affecting. In short, stripped of the expectation of having to be "the most cutting edge comics on the planet, ca. 2003" and featuring work by many artists who have gone on to produce a lot more work, I'm pleased to say that KE4 still stands as a collection of totally readable, enjoyable, artful comics. SPURGEON: The one thing I actually remember more about any individual works in there is that it was a very satisfying read overall, it's not a book I dive into for specific gems but one I have re-read like I re-read a lot of single-author graphic novels. Do you agree with that assessment of its general readability? Is there a skill to that, is there something an anthology editor has to do? KARTALOPOULOS: I understand what you're saying in that there might not necessarily be many individual pieces in this volume that one might single out as all-time-favorites, although there are plenty of perfectly good, representative pieces by great artists in here. I agree that it's quite readable. The work is consistently strong, it's quite diverse, but it somehow seems to belong together. I know that any good anthology editor spends a lot of time sequencing work, and this book is well paced throughout. If Sammy didn't pioneer the use of colored pages and single images as sequencing devices within comics anthologies, he certainly entered these techniques into the current design lexicon through their effective use here. SPURGEON: The germ of Dave Lasky and Frank Young's forthcoming Carter Family project was in those pagesâ€¦ what did you think of that work, which doesn't seem to have a lot of similar work beside it in that anthology? How important is it that anthologies provide a home for cartoonists like Dave Lasky that seem to have only a minimal amount of publishing momentum on their own? KARTALOPOULOS: I thought that piece was strong, and I think it holds up. I'm looking forward to seeing the forthcoming graphic novel. Certainly for me, browsing the book at MoCCA, Lasky's piece probably functioned in a way that it probably functioned for many people: it gave me some confidence that there'd be some accessibly attractive, narratively-driven work that I could spend some time with even if the more graphics-heavy pages didn't end up winning me over. I don't think this was calculated; I think Sammy was articulating his own range of interests as an editor and cartoonist ("Poor Sailor" may be the most "similar" work in the book). His range of interests created a range of access points for different readers. 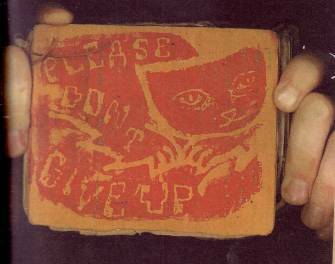 SPURGEON: Another one I wanted to ask about is Souther Salazar's piece, "Please Don't Give Up." I was very much a proponent of Salazar's comics pieces -- it looks like he's gone in a different direction to significant return and satisfaction and god bless him -- and I wondered how you felt about that piece and Salazar's comics stuff generally. KARTALOPOULOS: At the time this hit my "not comics" button a bit, but I was also undeniably moved by this piece. The facsimile reproduction of Souther's hand-made book seemed highly unusual at the time, and now just seems like part of the vocabulary in constructing books like this. SPURGEON: One thing I remember about how this book was received is that some people perturbed at the number of works that were just series of visuals, not strictly comics as much as art work, flat out. It's something I've heard again with KE7. Does the number of pieces of visual art included in an anthology like this one change the way you feel about it as comics, or is this just comics' very conservative side being brought to bear? KARTALOPOULOS: I'll admit to having had some of that response. I was definitely looking for deeper and more challenging comics experiences at the time, and was perhaps confusing art that was giving me that kind of experience with art that intended to give me that kind of experience, if that makes any sense. I came around pretty quickly, though. Even Arcade and RAW included single images and illustrated prose as part of the mix. I can appreciate that approach more now than I did in 2003, and KE4 probably nudged me along somewhat. I think in the end I just had a positive response to the way the book was sequenced, as we discussed earlier: the way that single images and other "breaks" made the thing read like a finely crafted mix-tape. I think that's a big reason why this book is built to last as a readable anthology, even if many of the artists have gone on to do other kinds of work. Beyond that, though, I think Sammy was clearly far-sighted in seeing connections between newer comics and an alternative gallery world that has embraced narrative art and other work on paper in a big way. It's telling that Kramers did attract criticism at the time for including other kinds of art (although I think The Ganzfeld and Blab were already mixing comics and graphics). It seems so normal now. 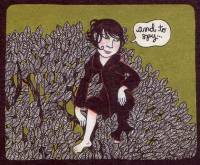 SPURGEON: As you and I are having this conversation, Jeet Heer just posted a piece at Comics Comics on anthology as autobiography. What does KE4 -- Kramers Ergot generally, even -- say about Sammy Harkham other than the fact that he knows a lot of good cartoonists? KARTALOPOULOS: Most immediately, KE4 reveals Sammy to have been very perceptive about other people's work. In 2003, many of those artists were self-publishing. Today, most of them have books with publishers. I think Sammy observed that these artists were operating at a level of fluency that demanded attention, he recognized that this work was being neglected by publishers, and he wanted to present this work in the best possible way, both in terms of production values and in terms of a coherent shared context. Sammy is an ambitious young cartoonist who is also passionate about the work of his peers. SPURGEON: You called this an obvious important book of the decade in an e-mail. How and where do you feel KE4 had an influence on comics? KARTALOPOULOS: I think it had a variety of influences. I think it helped open up existing publishers to the possibility that there was a generation (or two) of artists younger than Dan Clowes and Ivan Brunetti who were making valid work, even if that work didn't necessarily adhere to the same kinds of craft values or stylistic conventions as the previous couple of generations of independent comics. I recall thinking that Fantagraphics and Drawn and Quarterly both started publishing more work by younger artists after Kramers made a sensation. I think Kramers was also a strong contributing factor, as I mentioned before, in cementing the legitimacy of a post-Panter/Providence-influenced style of art-making within comics. Although there were other precedents, including Tom and Jordan's publishing efforts, I think the success of Kramers helped create a context for some of the projects PictureBox and Buenaventura Press eventually took on (not to detract at all from the vision, hard work, risk, and creativity Dan and Alvin bring to bear in order to conceive and execute these projects). In 2003 it would have been impossible to predict that the editor-publisher of Highwater Books would become the creative director of Drawn and Quarterly. I think Tom inspired Sammy to some extent, and I think Sammy's success helped inspire publishers like Drawn and Quarterly to reconsider their aesthetic range, so that's potentially an interesting cycle to consider. I know Kramers as a series has inspired many young artists individually. And, as I mentioned previously, I think it's affected the way this generation of artists and publishers think about the possibilities of format and design in comics. That's a lot of influence. SPURGEON: Will there continue to be anthologies in the kind of central role they played in this decade and in past decades? Will on-line publishing have a similar interest in publishing. Will there be anthologies on this interview series if we do one ten years from now? KARTALOPOULOS: I'm sure online publishing will continue to assume many traditional functions across the board. 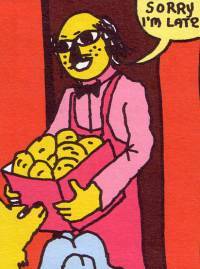 I think anthologies like Kramers will continue to exist for at least the next ten years, as long as there are artists who are interested in producing short form comics and who are simultaneously interested in the particular aesthetic qualities of work printed on paper. The only question is whether or not the marketplace will allow this material to get printed and distributed in sufficient quantity that it might find a broader audience, or if these kinds of books will be constrained to essentially boutique publishing that serves a rather narrow, rarified audience. It's just a question of how many people will continue to care about these distinctions and what kind of system they can support. The other thing anthologies have going for them is editorial integrity. This is something magazines are rapidly abdicating. There's something to be said for the thought-through qualities of an "issue" (whether it's periodical or book-length) as a coherent editorial unit that's been purposefully composed by a smart editor. Magazines lose this entirely when they become magically updating newspaper pages on a computer screen. Kramers Ergot 4 definitely had that kind of unity. It's hard to point to many stories in that issue as being emblematic of KE4 in particular or the ideas that Kramers seems to represent for people, but this issue as a whole, appearing when and how it did, radiated a new kind of integrity. Sammy prodded a bunch of scattered artists to produce work that, assembled together, seemed to signal some new movement in comics. These artists were all putting out work before Kramers Ergot 4 was published, but they were under-recognized. A good editor concentrated their energies between two covers and changed contemporary comics. * Kramers Ergot Vol. 4, Sammy Harkham and Various, Avodah Books, softcover, 340 pages, 9780967798950, 2003.